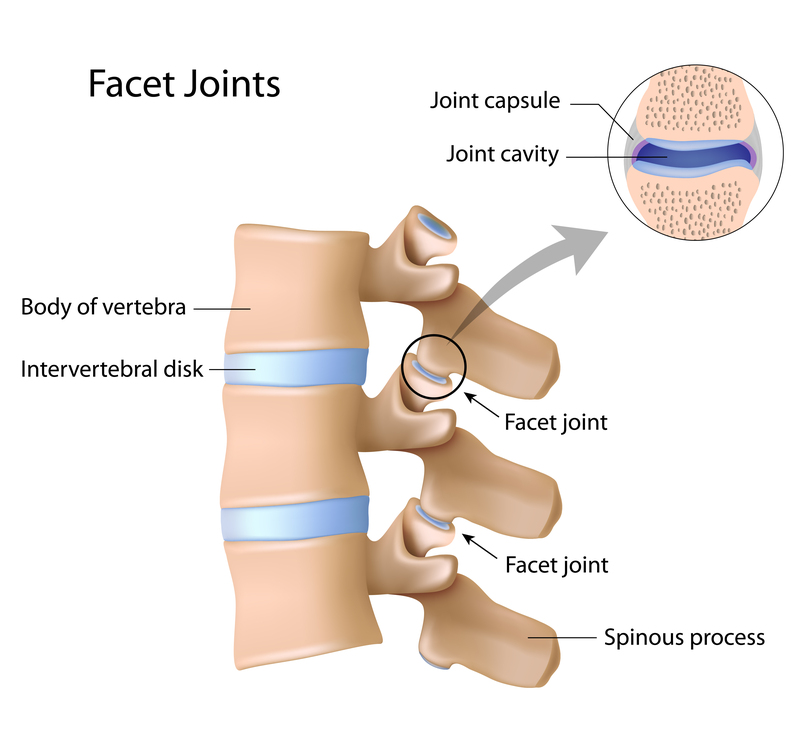 The correct term for the joints in the spine is ‘facet joints’. 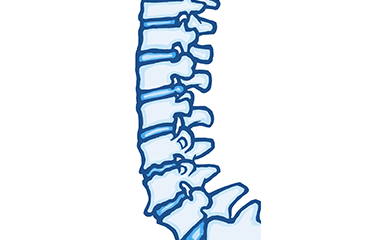 Each vertebra has four facet joints (imagine the vertebra as a square with one joint in each corner). There are some vertebra in the neck that are unique. C1 and C2 (called the atlas and axis respectively), are specialised to allow for the movement and rotation of the head. 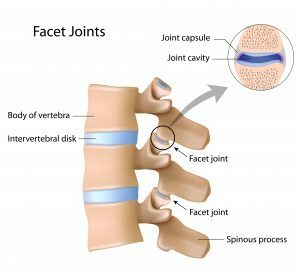 All the facet joints link the spine together and are important for preventing excessive rotational and twisting forces in the spine which would otherwise damage the discs. They also share some of the load bearing responsibility of the spine. When there is a loss of mobility in the spine, this typically means the facet joints bear a greater load than normal. This is especially true if there is some imbalance in the body and one side of the spine takes more strain than the other. This can occur for all sorts of reasons such as repetitive strain injury through repeated lifting, or one single lift in an awkward position, or through sudden trauma such as slipping on ice. Common day-to-day examples are digging in the garden, hoovering in the home or repeated manual handling events in the workplace. It is also important to remember that putting the spine under sustained constant load over time is also detrimental. An example would be driving over long distances or the cumulative effects of sitting for long periods during long haul flights. People usually experience sharp pain for particular movements such as leaning back or twisting or bending forwards. Pain can be unilateral or bilateral and can sometimes refer into the upper buttock region. Facet joints are also subject to wear and tear and this gives rise to another set of conditions. 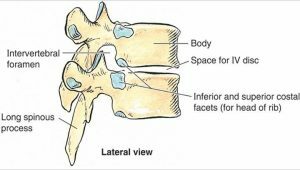 Just like the vertebra the body reacts to the increased load on the facet joints by laying down more bone in the joint margins (this is called facet joint arthropathy). This process is accentuated by degeneration of the intervertebral disc which shrink as we age, thus imposing greater load on the spinal joints. 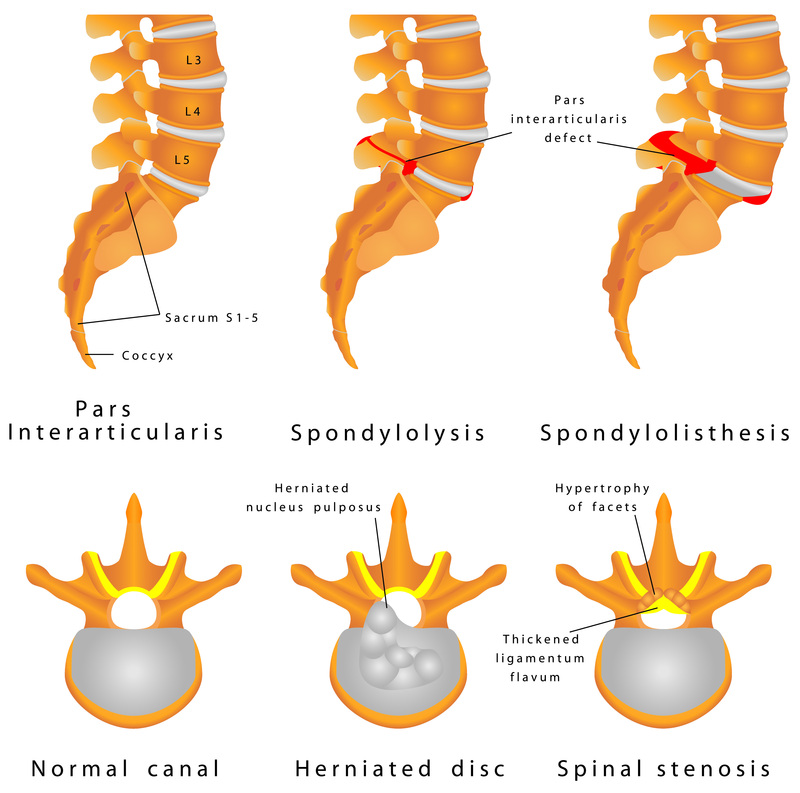 In some cases, the extra bone can narrow the gap where the nerves exit the spine and if the bone pinches against the bone (referred to as lateral stenosis as seen under spinal stenosis), it can cause referred pain into the leg. The picture below demonstrated another example of hypertrophied facet joints. Osteopathy can treat this effectively by using gentle techniques to help release the joint concerned and relieve muscle tension. The pelvis comprises two large wing-like bones called ilea and a smaller triangular shaped bone called the sacrum. 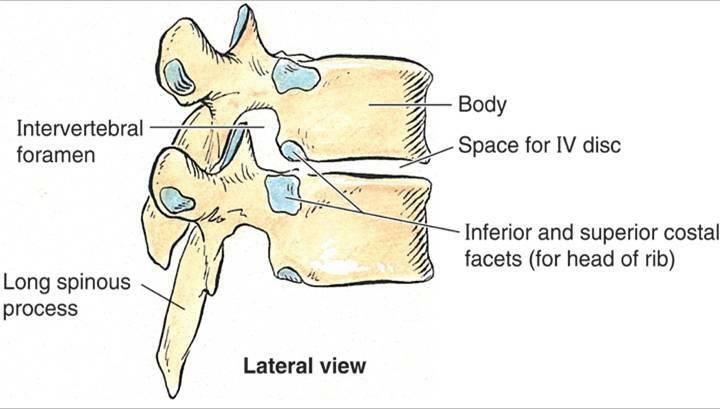 The sacrum fits in between the ilea at the base of your lower back and attaches to the bottom two joints of the spine. 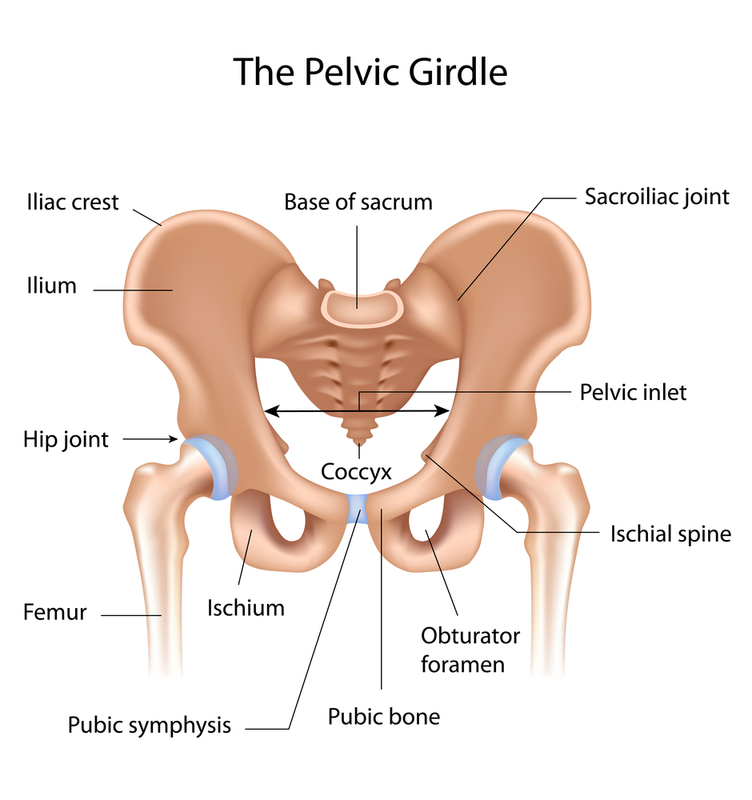 The sacroiliac (SI) joints are formed by the connection of the sacrum to the right and left iliac bones. While the vertebral joints in the spine have a reasonable degree of movement the sacrum is made up of five vertebrae that are completely fused together and therefore have no natural movement. The sacrum and the two large pelvic iliac bones are held together by an extensive collection of strong ligaments. These can be damaged and are a potential source of lower back pain. Some studies suggest that the prevalence of SI joint pain accounts for up to 20% of chronic lower back pain presentations. 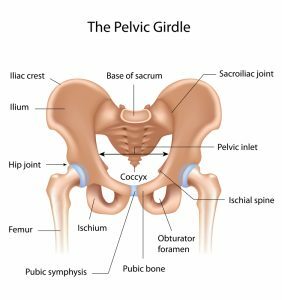 Sacroiliac joints are also subject to degeneration and can subsequently cause diffuse pain in the lower back or the hips. Pain may also be present in the groin and thighs. Typical Symptoms; Pain at the base of the spine that is dull and achy but sharper for activities such as sitting. Defecation can be painful.